How would you like to be able to quickly and easily home-make your baby organic, wholesome, preservative-free food for a fraction of the cost of store-bought baby food? 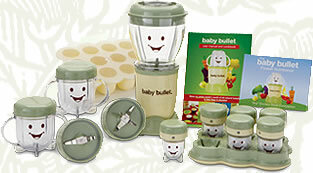 For information on the differences between homemade baby food versus baby food in a jar, read the health tip Baby Food. This is the most wonderful kitchen gadget! It makes baby�s food preparation so easy. And, you can control exactly what goes into each meal. What a great idea! You can puree fruits and vegetables in any combinations you want. You can even make your own cereals from whole grains. Check out Baby Bullet here.